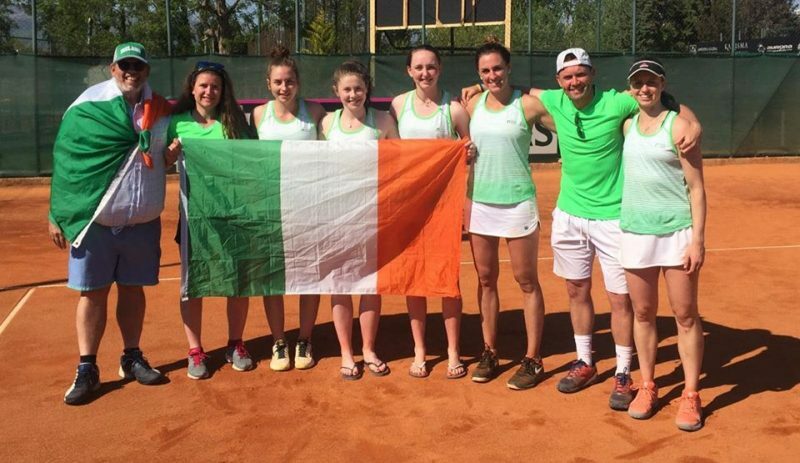 The Irish team made up of Sinead Lohan, Jane Fennelly, Rachael Dillon, Juliana Carton, Aisling O’Connor and captained by John McGahon took part in this year’s Fed Cup by BNP Paribas in the Europe/Africa Zone Group III. The tournament took place in Ulcinj Bellevue in Montenegro from 17th – 20th April and Ireland were drawn in Pool B along with Egypt, Morocco and Kenya. It was a tough first day for the Irish team as they were defeated by Egypt who went on to gain promotion for Group II. Sinead Lohan fought through a tough battle to win the first singles rubber 4-6 6-2 6-1. Up next was Juliana Carton in her Fed Cup debut. Juliana put up a good fight but was defeated 6-4 6-3. It went down to a deciding doubles encounter with Egypt coming out on top. The Irish team put the defeat behind them and showed true fighting Irish spirit in the days to follow. Day 2 saw the Irish team face Morocco with Jane Fennelly going close in her singles rubber and Sinead Lohan coming out on top in her rubber. It went down to a deciding doubles encounter once again, but this time Sinead Lohan and Rachael Dillon got the win and Ireland claimed victory over Morocco. Day 3 saw Ireland face Kenya with the team’s youngest players Juliana Carton and Aisling O’Connor both getting their first Fed Cup wins to give Ireland a 2-0 lead. Fennelly and Dillon won the doubles to give Ireland a convincing 3 – 0 victory. On the final day Ireland came up against Montenegro in the 3rd/4th place play off. Sinead Lohan claimed her 3rd singles victory of the week to put Ireland 1-0 up in the tie. Juliana Carton came up short after putting up a valiant effort, meaning yet another deciding doubles rubber was to take place. Sinead Lohan and Rachael Dillon played the final rubber of this Fed Cup Campaign and claimed victory 6-4 3-6 6-3 to secure 3rd place for the Irish team.